This was good and dead simple. I boiled some eggs till runny and sauteed some sopressa, bacon and mushrooms, tossed through some blue cheese, white wine and cream. That was it. Sopressa is an Italian smallgood but any decent salami would work. If you don't like blue cheese, use a little brie instead. After I plated this up I added some cracked pepper and chilli flakes which were great. I think also a small squeeze of lemon would cut through the richness. It is rich. Only boil the eggs till runny (place in when boiling, return to the boil for 4 minutes, slightly longer for XL) then place in an ice bath to stop the cooking process. Saute the bacon in the olive oil until it has colour, add in 2/3 of the sopressa and all of the garlic and cook for a further 2 or so minutes until quite fragrant. Add in the mushroom and cook until soft and with colour. Add in the blue cheese slices tossing to melt, pour in the white wine and toss, toss through the cream. Remove from the heat. Carefully peel the eggs which allows time for the mushroom mixture to cool slightly. Mix the mushroom mixture through the baby spinach (I used my hands) and divide amongst plates. 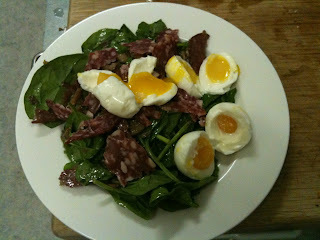 Top the spinach with some of the uncooked sopressa, an egg or two, some cracked pepper and chilli flakes.